The dry white wine, both vigorous and sensual. When young, this very lively mineral wine expresses the volcanic character of the soil, naturally rich in sulphur; it can therefore be necessary to leave it to mature for 2 or 3 years, to settle. It is produce from the grape variety Asyrtiko (70% of vineyard area) is on Greece's best white wine grape. It is high in sugar-and therefore alcohol-levels with a high level of acidity intact. To round out its somewhat sparse fruit and to compensate for a certain lack of aroma, it is traditionally blended with the flowery Aidani Aspro and more replete Athiri The famous Vinsanto ( vin-Santo, wine of Santorini) is one of the oldest wines in the world, since it was already being produced in Homer's time and was the main export commodity of Santorini when the ships of Oia's ship-owners carried vinsanto to Odessa on the Black sea and returned home laden with Venetian furniture and household furnishings from Constantinople This is a fortified wine with no added alcohol. The grapes are left on the ground, on straw, to dry in the sun for 2 or 3 weeks after harvesting. The wine is matured for at least 24 months in barrels then put on sale after 5 years. This wine, very rich in sugars and with a low alcohol content, has to be drunk chilled. 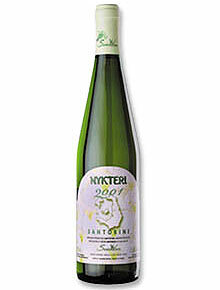 Since 3,500 years ago, the Nykteri is synonymous to Santorini's famous white wines. The formula to 'instant wine making' on the night of the same day that the grapes were harvested solved the problem of the variety's sensitive aroma deterioration. The Nykteri comes from the Assyrtico, Athiri and Aidani varieties. The wine making temperature does not exceed the 18oC in order to preserve even the tenderest aromas of fermentation. The wine is matured for 3 months at least in barrels. In this way the wine's contact with barrel's wood gives the Nykteri a special finesse. Characteristics Crystal-clear, semi-yellow wine. Dominated by the aromas of jasmine, citrus fruits, flowers and pear, all these enhanced with a gentle vanilla sense. A strong body with warm personality and a long lasting taste. It is served in 11-12oC. It is perfectly accompanied with grills and poultry as well as with local Greek dishes such as tomato meatballs and fava dip. ".. No dessert wine can be compared to the white Santorini Vinsanto. It is produced by grape, which is placed in the house terraces, displayed in the sun for 15 days before it goes to the wine press. After one year it becomes an exceptional sweet wine .."
VINSANTO wine is still produced in the same way. The name of the wine, VINSANTO (vino-santo: the wine of Santorini) proves wine's unique relation with the island. The uniqueness of the wine is characteristic because this natural and early stoppage of the fermentation process is succeeded with the use of indigenous yeast without the addition of alcohol. 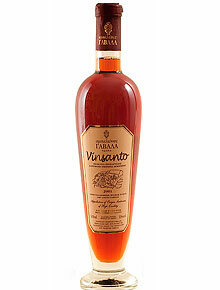 Vinsanto is usually low in alcohol and barrel-aged for a period of years before being bottled. In the past, according to Lambert-Gocs, a blend of white Asyrtico and red Mandilaria was considered an ideal mixture. These days the Santorini appellation insures that Vinsanto is made exclusively from Asyrtiko and Aidani. Characteristics The orange-yellow colour with intense brown sheen reminds us of a different kind of wine. It has an unusual aroma that is dominated by aging, spices, honey, raisins and the lemon flower. The traditionally sweet taste is intense but it is balanced with variety's acidity. A round velvet rich wine which tries to finesse the tongue between honey and lemon. It is served cold between 6 and 8 degrees Celsius as a dessert wine to be enjoyed alone or to accompany fruits and sweets.